Losing photos you’ve taken, whether it’s due to accidental deletion, device formatting or data corruption, is a terrible feeling. Often, your camera device’s memory cards, the most common storage media, are what suffer data loss. Luckily, there are a number of photo recovery softwares available that can help you get your digital data back from a loss. Whenever you format a device or delete any picture from your camera or any digital storage media, the link to the photo is removed, but the actual data remains. You can recover it unless it has been replaced by new data. Photo recovery programs usually work on physically available data. In this article, we will explore a few free photo recovery programs and their performance. Here are the top five photo recovery utilities that can recover data from an SD card or from a flash memory device (such as a USB stick). PhotoRec is a free picture recovery utility. This tool is available in two versions: one runs in the command prompt and other version only runs on 64-bit Windows. PhotoRec is a signature-based file recovery utility that supports over 440 file formats including JPG, MSOffice, OpenOffice documents. This application is widely preferred by users due to its safe recovery techniques. It will check your complete partitions in a safe mode without affecting partitions and file systems and search all the missing files. 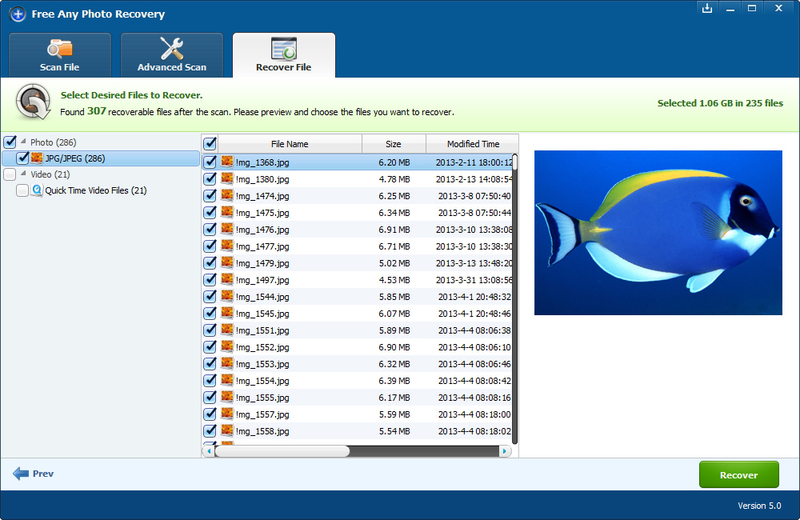 PhotoRec focuses on all the file formats while searching; it’s not specific to just photo recovery. Overall, you can say that PhotoRec is a powerful tool that can provide you with a quick and safe data recovery. FAPR is an efficient and freely available photo, video and audio recovery software that allows you to recover deleted files from your PC’s hard drive and USB devices. This tool supports photo recovery from almost all types of storage media, such as Sony memory sticks, Zip Disks, MMC Cards, memory sticks, flash cards, Secure Digital Card, IBM Micro Drive, SD Cards, XD Cards, Hard Disks and Mini Disks. It is developed with an advanced file scanning mode that can help you to retrieve deleted or lost files easily. Additionally, this application allows you to preview recoverable photos and even videos before complete recovery. Pandora Recoveryis a freeware that scans the complete computer disk and finds all the deleted files and folders which are not yet overwritten. This tool supports recovery of all deleted files, including pictures, songs, movies and documents, etc. In almost every case Pandora Recovery can restore lost data, as its powerful scanning module finds all the existing and deleted files and directories from your hard drive. The tool can restore all the deleted files to a user-specified location. Although Pandora Recovery does not provide a guaranteed recovery of all accidentally deleted data, if there is any trace of the lost data, it should be able to find it. Undelete 360 is powerful freeware that supports deleted photos from computer hard drives, USB drives, floppies, and digital cameras, etc. This efficient utility allows you to recover deleted files from the recycle bin, and lost files due to virus infection, software or hardware failure, hard drive corruption, or unexpected system shutdown. The tool does not claim to provide guaranteed recovery, but is capable of recovering accidentally or recently deleted data. Additionally, Undelete 360 includes a Wipe Files software that can completely delete files beyond recovery. Stellar Phoenix Photo Recovery software is a highly reliable and often-recommended photo recovery software. It recovers all lost and deleted photos, along with music and video files from corrupt or formatted hard drives, memory cards, or external storage devices. This easy-to-use utility can smartly and efficiently recover deleted multimedia files, and save them individually with their original file names. This tool can scan storage devices with over 2TB storage capacity. Additionally, this powerful software provides an option to add new file headers to increase the scope of recovery. Stellar Phoenix Photo Recovery software may be the most reliable tool among these five, offering complete recovery of almost all types of file systems from all types of memory card devices.